Upon texting the keyword, Chipotle will reply within a few days with a coupon for a free burrito. If you’re like us, and you’ve been eating at Chipotle despite the horror stories of disease spreading around their chain, this is great news for you. You can continue to fuel your addiction, but now without the downsides of draining your bank account and then disappointing your parents when you ask to borrow money. Even if you’re a bit weaker and slightly less courageous, and you’ve been abstaining from the delicious goodness of Chipotle, you’re still a college student. Free food is free food, regardless of whatever microscopic pathogens come along with it. 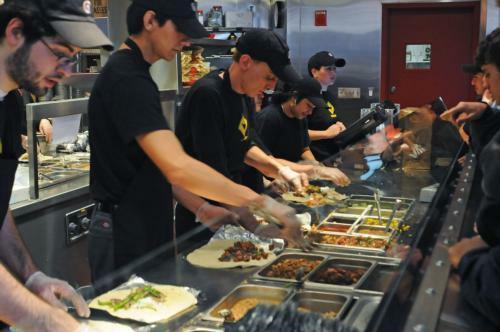 Besides, Chipotle had a Skype sesh with all of its employees during lunch to talk about food safety, remember? Clearly the problem is resolved. Still not convinced? Based on the amount of money Chipotle lost as a result of no one wanting to eat contagion-burritos, we’re hoping that food safety now qualifies as a worthy investment. We suppose the answer will be clear this week, when everyone gorges themselves on free burritos… So, text away, and may the E. Coli odds be ever in your favor.